BEST PRICE+ BEST SERVICE + FREE ESTIMATE! Plumbing is important. In order to live, people need to be guaranteed that their drinking water is clean and safe, and wastewater– which can be a major health risk and ecological hazard– needs to be properly disposed of. Plumbing, sewage disposal, and septic systems are all subject to codes and regulations that are designed to ensure clean drinking water and safe, responsible wastewater disposal. Licensed and certified plumbers in New Jersey must carefully adhere to federal, state, and local building codes when providing sewer repair services. Below, we’ll explain a few of the New Jersey plumbing subcodes that pertain to sewer pipes and septic systems. We can’t list them all, since there are over 400 total pages of New Jersey plumbing codes and subcodes, but we’ve selected a handful that are relevant to our septic and sewer services. You’ll learn a little bit about what they are, what they mean, and what it means for sewer line installation, sewer repair, and septic tank services in New Jersey. Need sewer repair, drain repair, or sewer line installation? 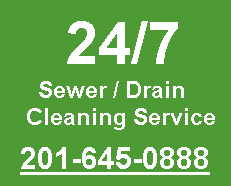 Call us any time at A1 Sewer & Drain Services for same-day NJ plumbing service and a free cost estimate, at 201-645-0888. Septic system components are required to be installed at a minimum distance from other nearby elements. Distances are named for septic tanks, pipes, drainfields, seepage pits, suction lines, and other installations. Location (16.4.4.1): The sewage disposal system should be at the lowest point on the premises, although with specific approval, they can be installed at a higher elevation in certain circumstances. Watersheds (16.4.4.2): Sewage disposal systems may not be located on any watershed for the public water supply system, to prevent contamination. Septic tanks & underground disposal (16.4.4.3): These cannot be located closer than 200 feet (horizontally) of a high water level in a reservoir. They also cannot be less than 3,000 feet upstream from an intake structure on the banks of a tributary stream. In order to install a septic system for on-site wastewater disposal, sewer service contractors are required to carry out percolation testing. This determines the soil’s absorption capacity. Septic tank capacity must adhere to certain specifications, determined by the number of bedrooms or apartment units, along with the occupant load or number of plumbing fixture units. For example, in a single-family dwelling with 4 occupants, the liquid capacity of the septic tank must be at least 1200 gallons. Seepage pits can supplement a septic tank drainfield, and in some cases, conditions can favor the use of a seepage pit on its own. Naturally, these must not penetrate the water table. For disposing of effluent from septic tanks, the number and size of the pits is determined based on percolation tests. These are designed and built based on the available percolation area. The filter material needs to be at least 6 inches deep, and made from gravel, crushed stone, or slag in the 1/2″-2.5″ size range. Underground drain pipes and sewer laterals must be installed in compliance with general regulations outline in Section 2.6. When existing pipes conform in material quality with new pipes, you can combine old and new drainage installations. Horizontal drain pipes must be installed at a uniform slope. This must be over 1/4″ per foot, or 1/8″ for pipes 3″ and larger. With special permission, lesser slopes can be used in some areas. Pipe size should be proportional to drop per foot, and sizing is determined based on fixtures, occupants, and other factors, in tables provided in the official New Jersey plumbing code documentation. Many buildings use sump pumps or ejector pumps as part of their sewer and drainage systems. Drains that can’t be discharged by gravity (for example, in a furnished basement) must go into a sump pit and pumped away. The sump pits should be at least 15 inches in diameter and 18 inches in depth. 11.7.6: Grinder Pump Ejectors: When approved by local authorities, and installed per manufacturers’ instructions, grinder pumps are permitted. The rated flow velocity must be at least 2 feet per second, and specifications are given for the size of the discharge piping. 11.7.8: Sewage Ejectors or Sewage Pumps: These must have a minimum capacity of 20 gallons per minute. They require both a backflow valve and a full-way shutoff valve. If they are not grinder pumps, they must be capable of passing solids that are at least 1.5″ in diameter in single dwelling unites, or 2″ in diameter in other units. 11.7.9: Individual Fixture Ejectors & Pumps: It is permitted to have a single fixture discharge directly into a pump, with drain pipe size determined by hydraulics. 11.7.10: Macerating Toilet Systems: Macerating toilets liquefy waste with a rotating blade. The sump must have a 1.25″ vent, and the discharge line must be at least 3/4″, with a check valve and shutoff valve. The distance between the macerating toilet and a gravity drain should align with manufacturer recommendations. Some plumbing fixtures, such as washing machines and dishwashers, produce soap suds from detergents. Cleanouts must be spaced at intervals of 75 feet for pipes 4″ or smaller in diameter, and 100 feet for pipes 5″ and larger. On a building’s sewer line, they must extend vertically to or above the finished grade level. Cleanouts are also required at places where there is a change in direction using 60, 70, or 90 degree fittings. If the change in direction is less sharp, using 22.5 or 45 degree fittings, a cleanout is not necessary. The size of the cleanouts is determined by the size of the piping. For sewer pipes greater than 12 inches, a manhole is installed as a cleanout. The distance between these should not exceed 300 feet. For a pipe greater than 8 inches but smaller than 12 inches, manholes can be used instead of a cleanout, but it is not required. If a manhole is indoors, it must have a bolted, gas-tight cover, to prevent sewer gases from escaping into the interior of a building. Any sewer cleanout must not be covered up permanently with materials like cement or plaster. Covering plates are used instead. Backwater valves are required for fixtures and drain inlets that are subject to backflow and flooding from public sewers. The valves must conform to ASME (American Society of Mechanical Engineers) standards. They should be installed so that backflow valve repair plumbers can access the internal parts for maintenance, cleaning, testing, repairs, and replacement. Trenching and excavation for underground sewer lines and drainage pipes must comply with occupational health and safety (OSHA) standards. Under the pipe, there must be firm, stable bedding for support. In some cases, if the soil conditions are right, the trench bottom may provide adequate bedding. Otherwise, bedding is added at the bottom, made from clean sand, gravel, or similar materials. If rock is encountered, it should be removed to a depth of more than 6 inches below the pipe. 2.6.2: Sidefill: The areas adjacent to the pipe between the bottom and the horizontal centerline are filled with bedding material. This should be placed by hand, then compacted. 2.6.3: Initial Backfill: After the sidefill has been installed, the trench should be backfilled, with at least 2 feet above the top of the pipe. It should be placed in layers less than 6 inches, then compacted. For the initial backfill, heavy compacting equipment should not be used. 2.6.4: Final Backfill: The trench is further backfilled from the top of the initial backfill to the to the finish grade. Heavy compacting equipment may be used. 2.6.10: Trenchless Pipe Replacement Systems: Trenchless sewer replacement and drain pipe replacement should be performed in accordance with the procedures and equipment recommended by the equipment manufacturer. This includes following manufacturers’ guidelines for pipes removed from beneath paved areas or concrete slabs. 2.9.1: Breakage: Pipes that pass under or through a foundation wall need to be protected from breaking. 2.9.2: Corrosion: Pipes that are subject by corrosion by passing through or under corrosive fill like cinders or concrete should be guarded against external pipe corrosion by protective coatings. 2.10.1: General: No materials can be deposited into the sewer system that will obstruct, damage, or overload the system; that could interfere with the normal operation of sewage treatment processes; or that could be hazardous to people or their property. 2.10.2: Industrial Wastes: Waste products from manufacturing or from other industrial facilities cannot be discharged into the public sewer system, unless local authorities have determined that it will not cause damage. Openings for plumbing pipes must be properly sealed, so as to maintain the integrity of walls, floors, ceilings, or roofs that are penetrated by pipes. 2.19.1: Availability of the Public Water & Sewer: The water distribution and drainage systems of any building with plumbing must be connected to the water supply and sewer mains, as long as those are within a reasonable distance. 2.19.2: Private Systems: When public water and/or sewers are not available, private systems must be installed to meet Health Department standards. Light and ventilation should be present, according to other applicable building codes. Plumbing pipes and fixtures cannot obstruct windows, doors, or other exits. Food and drinks cannot be stored, prepared, or displayed beneath overhead sewer pipes or drain pipes, unless those pipes are protected from leaking and condensation that could reach the food and cause contamination. Floor and shower drains installed above these areas must be equipped with seepage pans. Plumbing fixtures above, other than bathtubs, should be wall-mounted. Waste and overflow connections for bathtubs should be made above the floor and piped to a trap below the floor. If external temperatures will cause condensation, the pipes must be insulated. Paved areas, roofs, yards, and courtyards must drain to a storm sewer where available, or a combined sewer if necessary. Storm water from one-family and two-family dwellings can be discharged onto lawns or streets, as long as it flows away from the dwelling and does not otherwise create a nuisance. Stormwater should not be drained into sewers intended for sewage only. When separate sewer drainage and storm drainage systems are installed for the same property, the pipes can be laid side by side in the same trench. 13.1.5: Foundation drains: Foundation drains should be provided at the perimeter of cellars, basements, crawl spaces, and other building spaces below grade. They should be positioned either inside or outside of the footings, with perforated or open-joint approved drain tile or pipe over 3″ in size. The foundation drains should be laid in a filter bed of gravel, crushed stone, slag, recycled glass aggregate, or other porous materials, with at least 2″ of bed below the foundation drain. The drainage should be discharged to a storm drain, street, alley, or water course. If the foundation drain is below the point of discharge, one or two sump pumps with adequate capacity should be used. The minimum pump capacity should be 15 gallons per minute. Sump pits should be at least 15″ in diameter and 18″ deep. 13.1.10: Roof Drainage: Roof areas of a building should be drained with roof drains or gutters. The location and sizing of the gutters are determined by the design and pitch of the roof. 13.1.12: Backwater valves: Where foundation, areaway, or window well drains are subject to backflow, a backwater valve should be installed at the discharge line. 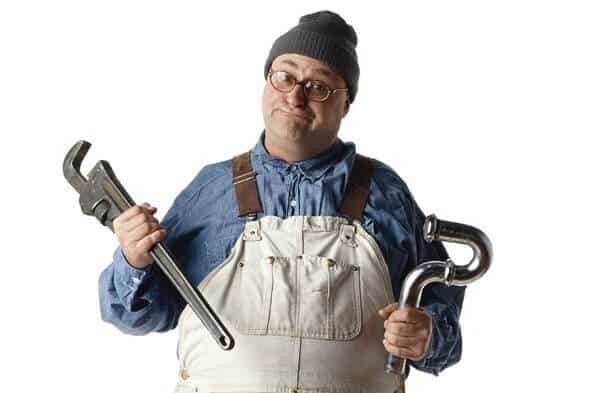 9.1.1: General: Drains from fixtures, fixture compartments, equipment, appliances, and other devices that require protection against backflow contamination or flooding should not be directly connected to a soil, waste, or vent pipe. They should discharge separately through an air break or air gap. 9.1.5: Food handling areas: Plumbing fixtures and appliances used for storing, processing, preparing, serving, or dispensing food should have indirect drainage. This includes steam kettles, steam tables, culinary sinks, ice machines, drink dispensers, and similar equipment. This does not apply to domestic sinks or domestic dishwashers. Will I Need A Permit for Sewer Line Installation or Replacement? For septic, drainage, and sewer services in New Jersey, contractors need to adhere to the specific codes. Along with code compliance, another concern is getting permits when needed. In some cases, sewer line installation or major sewer repairs, especially for large commercial and industrial systems, may require a permit. The New Jersey Bureau of Construction and Connection Permits (BCCP) provides a Treatment Works Approval (TWA) program. This regulates the construction and operation of things like wastewater collection, wastewater conveyance, and sewer mains. Its regulations are in place to protect New Jersey’s waterways from contamination caused by inadequate facilities. Permits are more commonly required for municipal sewer systems and large industrial wastewater disposal systems than for residential sewer service. Building, installing, or operating wastewater treatment works, including sewer extensions, sewer interceptors, domestic and industrial wastewater treatment systems, and holding tanks. Building, installing, or modifying any sewer line, pumping station, or force main that conveys at least 8,000 gallons of flow per day. Working on or installing facilities that compost, heat dry, thicken, digest, air dry, thermally reduce, dewater, or store sludge. Domestic or industrial treatment works that discharge treated water directly into surface water or groundwater (excluding most individual septic systems). Sewer laterals conveying less than 8,000 gallons of water per day. (For reference, a typical residential sewer line carries something like 200 gallons per day). Wastewater pumping equipment that uses a lateral force main connection to serve a facility with a projected flow of under 8,000 gallons per day. Septic systems or other subsurface waste disposal systems with an aggregate projected flow of less than 2,000 gallons per day. Plumbing installations, modifications, building renovations, or changes in facility usage that will increase the projected flow over a five year period, provided that the projected flow is under 8,000 gallons. Repairing or replacing existing sewer lines, so long as the diameter, location, and slope do not change significantly. Replacement for wastewater pumps, sewage treatment units, and sewage storage units, so long as their capacity and location will not change. Minor modifications to sewage treatment works, such as adding chemicals to improve performance or reduce unpleasant odors. Will Contractors Handle Codes & Permits? As local sewer service contractors in New Jersey, it’s our responsibility to ensure that all of the work we do is compliant with federal, state, and local plumbing codes, as well as obtaining any of the necessary permits. In the state of New Jersey, plumbers are required to be both licensed and certified in order to practice our trade. It is not permitted to repair, replace, or install plumbing, septic tanks, and sewer lines unless you are licensed. As you’ve seen, there are many codes and regulations surrounding plumbing and wastewater. Understanding these codes, and knowing what to look at to ensure that work is compliant, is part of being a fully licensed and certified plumber. Plumbing is no simple thing, and becoming a plumber takes quite a bit of training and education. The NJ Office of Attorney General’s Affairs mandates that candidates both meet experience requirements, and pass a written exam. Have the required experience repairing, installing, designing, and maintaining plumbing systems. This does not include supervisory or managerial tasks, only real, hands-on field experience. By focusing primarily on drainage, sewer, and septic services, we’ve all become Bergen County’s local experts in all things sewer and wastewater related. Adopting agency, aka Authority Having Jurisdiction: Building codes for plumbing, drainage, and sewer installation are devised by agencies such as the National Association of Heating-Plumbing-Cooling Contractors. However, they only have legal standing if they are adopted by local authorities. Area drain: A receptor that collects surface water or storm water from an open area. Automatic flushing fixture: A device that automatically flushes water out of a fixture after each use, and does not need to be activated manually. Backflow connection: An arrangement in which backflow could occur. Backflow (drainage): A reversal of water flow inside the plumbing system. Backflow preventer: A plumbing valve designed to stop water from flowing the wrong direction, thus preventing backflow. Backflow can be caused by back-pressure, a result of equipment in a building that produces water pressure. This can include large boilers, nearby fire hydrants, and fire sprinkler systems. Backflow (water distribution): The flow of water or other liquids, such as effluent, into the water pipes carrying potable water supplies. Back-siphonage: Backflow created by a greater pressure in the potable system than in non-potable water pipes. Backwater valve: A device installed inside a drain pipe to prevent backflow. Boiler blowoff: An outlet on a boiler to discharge sediment periodically. Boiler blow-off tank: A storage vessel that receives the discharge from the boiler’s blow-off outlet, cooling it to a safe temperature before it is released into a drainage system. Building sanitary drain: A drain that conveys sewage. Building storm: A drain that carries storm water, but no sewage. Building combined sewer: A drain that carries both sewage and storm water. Building sanitary sewer: A sewer drain pipe that carries only sewage. Building storm sewer: A building sewer that carries storm water or other drainage, but not sewage. Cesspool: A lined and covered excavation that receives sewage and other organic waste from the drainage system. It retains solids, while allowing the liquid to seep through the sides and bottom. Clear water waste: Effluent in which the levels of impurities are less than that which is considered harmful, like cooling water or condensate drainage from refrigeration and air conditioning equipment. Combination waste and vent system: A system of designated waste piping with wet venting of one or more sinks or floor drains through a common waste pipe and vent. Contamination: The impairment of the potability of water that can create a public health hazard through poisoning or disease. Cross connection: A connection between one or more otherwise separate piping systems, one of which contains potable water, and others that contain water that may be contaminated or unsafe. The direction of flow between cross-connected systems is determined by a pressure differential. Domestic sewage: The water containing wastes from living processes. Double check valve assembly: A backflow prevention device that consists of two check valves that act independently. Sump drainage: A watertight and airtight tank that receives sewage and liquid waste, located below the level of drainage and sewer pipes, which is emptied by a sump pump. Drainage system: All piping within a premises that conveys sewage, wastewater, rain water, and other liquid wastes. This does not include public sewer main lines or on-site sewage treatment facilities. Drainage fixture branch: A drain that serves one or more plumbing fixtures, and discharges into another drain. Supply fixture branch: A branch of the water distribution system that supplies one fixture. Fixture drain: A drain from the trap of a fixture to the connection between that drain and any other drain pipe. Flow pressure: The pressure inside a water supply pipe near a faucet or water outlet when the outlet is open and flowing. Force main: A main line that delivers pressurized wastewater from a sewage or sump pump to its destination. Grease interceptor: A plumbing device that intercepts oily components of wastewater, often in commercial kitchens and food processing plants. Grease recovery device: A plumbing device that removes free-floating fats, oils, and grease from wastewater. The removed grease can be recycled. Grinder pump: A sewer pump that shreds solid materials. Health hazard: In backflow prevention, a health hazard is any substance that, if it contaminates the potable water supply, could cause death, illness, or the spread of pathogens. Indirect connection (waste): The introduction of waste into the drainage system by an air gap or air break. Interceptor: A device designed to separate and trap hazardous or undesirable materials from wastewater. Local ventilating pipe: A pipe on the fixture side of the trap through which vapors or foul air is removed. Macerating toilet system: A system that collects drainage from toilets, bathtubs, and other fixtures in the same room, then shreds solids with a grinder pump. Plumbing system: Includes the water supply, water distribution pipes, waste pipes, sanitary sewer pipes, storm drains, and other pipes that carry water through a building. Potable water: Water that is free from impurities that cause harm or disease, such that it is safe for drinking. Private sewage disposal system: A system that disposes of domestic sewage using a septic tank or mechanical treatment, allowing waste disposal without access to a public sewer system. Public sewer: Common sewer lines controlled by a local municipal authority. Public water main: A water supply pipe controlled by a local authority. Reduced pressure zone backflow preventer assembly: A backflow prevention device that consists of two independent check valves, force loaded into a closed position and separated by a chamber of air in between. Sand filter: A treatment device that removes solids or colloidal material from septic tank effluent. Sanitary sewer: A sewer pipe that carries sewage. Septic tank: A watertight waste receptacle that receives discharge from a building’s sanitary drainage system. Solids are separated from liquids, with liquids discharged outside and organic matter digested by microorganisms. Sewage: Liquid containing human waste. Sewage ejector, pneumatic type: A unit that uses compressed air to lift and discharge sewage to a gravity sewer system. Sewage pump: A submersible or vertical sewage pump or ejector, often with a grinder. Not sure what you need, what the scope of the project will be, or what it will cost? No problem! At A1 Sewer & Drain Services, we provide troubleshooting, problem diagnosis, and a cost estimate– at NO charge to you. When you call us, we’ll send out an experienced plumber to your property in as little as 45 minutes. We’re always happy to discuss your project and scope of work for sewer line installation, drainage systems, and more. For sewer and drain repair, we offer 24-hour emergency service. No matter what day or time it is, we can respond quickly to fix the problem immediately, before it can get any worse. If you have sewage backflow, a burst sewer or drain pipe, or a collapsing sewer lateral, call us right away for immediate emergency service. We have plumbers on call 24/7; just call us any time at 201-645-0888. Need experienced, licensed, and certified local contractors for septic and sewer services in NJ? Call us today for 24 hour emergency service: 201-645-0888.